On the morning of the last day of the contest period for the 2015 Wind Voyager Triple-S Invitational, first round Heats were still on hold due to variable wind conditions. 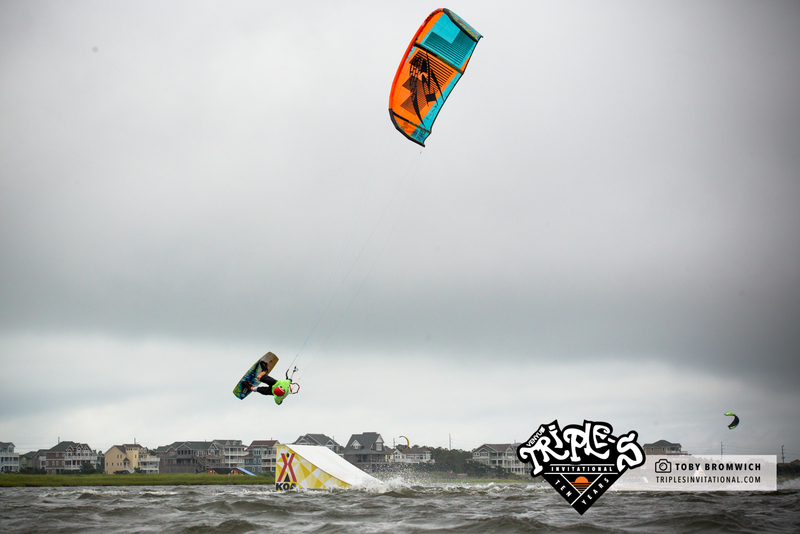 After a full week of incredible music, great parties, surfing and wakeboarding in Cape Hatteras, NC, everything came together the final day with premium wind conditions on Friday, June 5th. 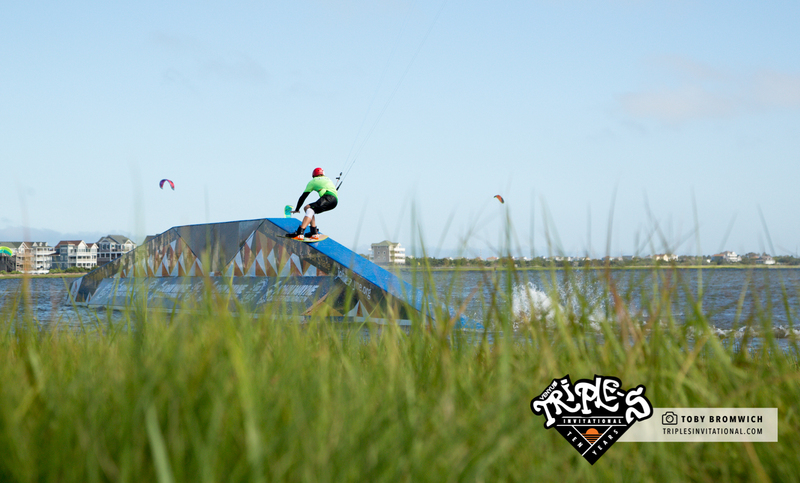 The action was nothing short of spectacular, as the world’s best wakestyle kiteboarders competed for $40,000 in prize money on the ramp and rail features in the REAL Slider Park. For the 10th Anniversary of the Wind Voyager Triple-S Invitational, event organizers debuted a new contest format focusing solely on park riding. The REAL Slider Park consists of 5 features: the Kampgrounds of America Kicker ramp, the North Kites Roof Top Rail, the Liquid Force Reverse Rainbow Rail, the Best Kiteboarding Super Kicker, and finally, the 82-foot John Wayne Cancer Foundation A-frame rail. Seeded into four Heats, riders had three attempts on each of the five park features to throw down their best trick. Each rider’s highest-scoring trick from each park feature counted towards his or her overall score. Immediately following the competition, spectators, partygoers and athletes swarmed the waterfront stage at REAL for the Wind Voyager Triple-S Awards Ceremony. The live music kicked off at sunset featuring Dub Island Sound System and the Dubplates with special guest Future Fambo. The crowd was eager to hear the contest results as $40,000 in prize money was awarded to the Men’s, Women’s, and Masters’ Divisions, as well as awards for Best Session, Best Wipeout, Rookie of the Year and the Slickstyle Attitude Award. 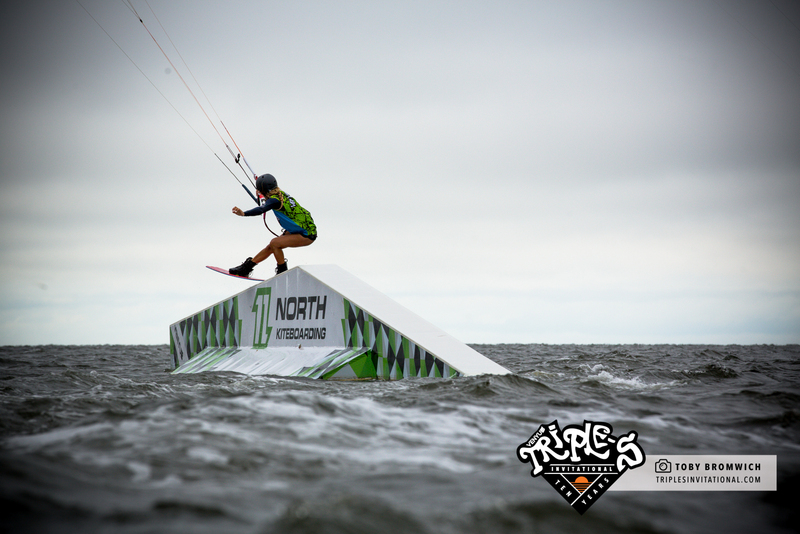 Sam Light (UK) and Colleen Carroll (USA) were crowned 2015 Wind Voyager Triple-S Champions, continuing their dominance of the event for the 3rd year in a row. The party rolled long into the night as competitors and spectators celebrated the final evening of the 2015 Wind Voyager Triple-S Invitational. Dancehall/reggae superstar Future Fambo guest starred with Wind Voyager Triple-S favorites The Dub Plates. Overall, the Men’s field was extremely close, as almost half of the competitor’s final scores were .25 to .5 points shy of each other (out of a possible total of 50 points). Throwing high-scoring spins and technical rail hits throughout the entire REAL Slider Park, Slingshot’s Sam Light took top honors for the third straight year. Sam was joined on the podium by second and third place finishers Billy Parker (USA) and Brandon Scheid (USA). 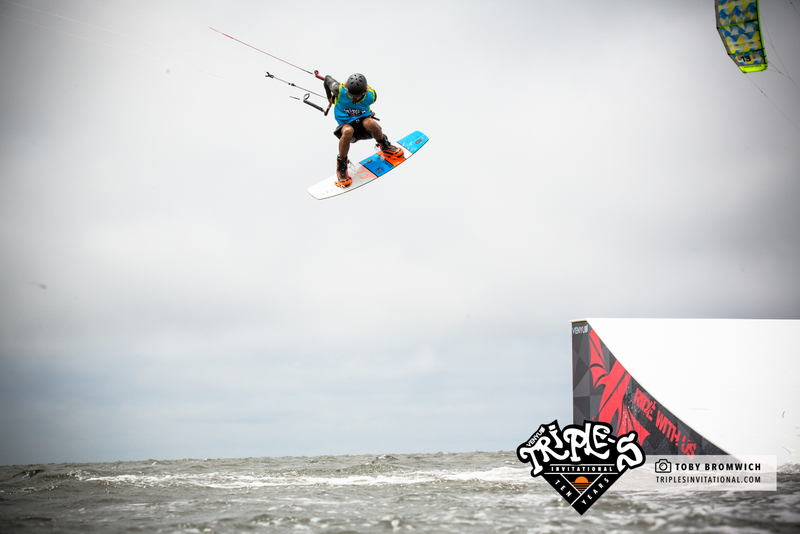 Posting solid scores across the board, James Boulding (UK) landed in fourth, while VKWC Freestyle World Champion Christophe Tack (BEL), a newcomer the Wind Voyager Triple-S, finished the event in 5th place. 2015 Wind Voyager Triple-S Invitational Men’s Winners (L to R) James Boulding, Billy Parkter, Sam Light, Brandon Scheid, Christophe Tack. Consisting of 10 riders, the competition in the Women’s Division was intense with competitors throwing spins and inverts off the kicker ramps and laying down solid rail hits on the sliders. Colleen Carroll distanced herself from the field to take 1st Place honors while Sensi Graves placed 2nd, followed closely by Victoria Solovenkyna in 3rd. Commemorating the 10th anniversary of the Wind Voyager Triple-S this year, organizers introduced a Masters’ Division, which featured some of the fixtures of the Wind Voyager Triple-S: Andre Phillip (ATG), Davey Blair (USA), and event co-founder Jason Slezak (USA). The Masters’ Division was integrated into the rest of the field of competitors, where Phillip placed 12th overall. 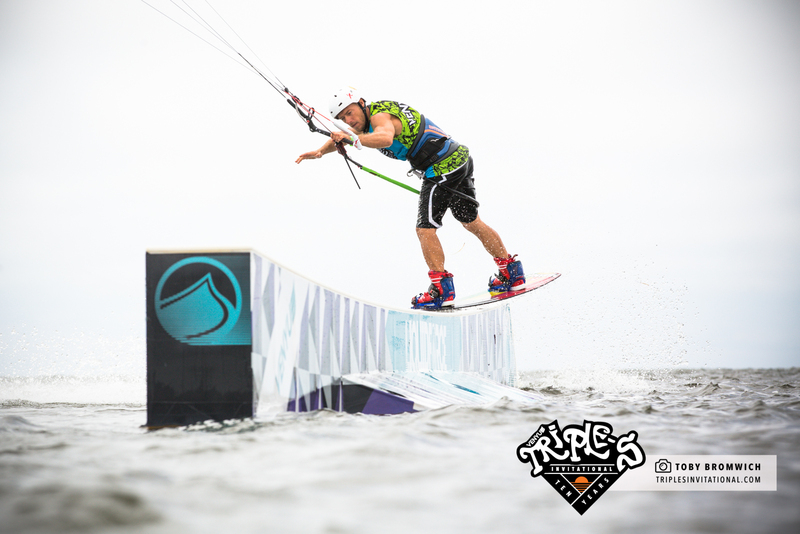 2015 Wind Voyager Triple-S Rookie of the Year, 5th Place Finisher Christophe Tack. Don’t miss the 2016 Wind Voyager Triple-S, June 4th to 10th, 2016.